Straight away the title to this article is deceiving. 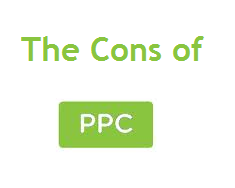 As well as there being many disadvantages or drawbacks to PPC, there are also a lot of pros that PPC contains. This is a reason why millions of people worldwide use PPC globally. It is the most desired form of advertising to use for those wanting to advertise online. However, like with pretty much anything, nothing is perfect. PPC applies to this that it is not the perfect form of online advertising. There are flaws in the system that do put potential advertisers off from using services such as Google Adwords. For this reason, here are the main cons in the world of PPC that put people off from using it. Although this is a reason why many people use PPC, it is a reason why many people also don’t use it. PPC: Pay Per Click. PPC evolves around only paying for the clicks you get on your adverts. This means from a beneficial perspective that you will only ever pay for actual traffic to your site unlike banner advertising where you could pay a fixed price for an advert and not gain any traffic. However, at the same time, paying per click has its flaws. An article I once did on click fraud explained that around 20% of all clicks on PPC adverts are in fact due to click fraud. From this, advertisers are wasting around 20% of their money when using PPC. Although click fraud is hard to prove and find, it’s worrying that people can still do it. Relating very much to clicks on adverts, the cost per click varies considerably too. From another article I done , the most expensive keyword in PPC is the keyword ‘Insurance’ which costs around $55. For publishers, this is great that keywords can change and become this expensive as it means they will make more money. However, the inconsistency of keyword prices in PPC can mean on one day, your main keywords are worth around $1, then the next day $2 and so on. In no time at all, due to no factors of yourself, your keywords may have got so expensive that PPC was not the cheapest form of online advertising for you. The fact that keyword prices can change is something that can potentially hurt advertisers in their pockets. Pay per click advertising is not a form of organic traffic too. It is known as ‘paid-traffic. For this reason, many advertisers are turned away and prefer simple methods of advertising such as SEO. Gaining traffic for some advertisers may be key to their success. For others, the type of traffic they gain will be just as important as the actual traffic they gain. Organic traffic is the safest and cheapest form of traffic but takes long amount of time to gain. Therefore, it comes down to time. If you want traffic fast, go for PPC. If you want long term traffic, SEO is the way to go.